Formulated with Silk-Luxe Complex, Redken All Soft Conditioner contains a unique combination of ingredients. Gold camelina adds luminosity and lustre, avocado oil restores moisture and provides replenishment, olive oil intensely conditions your hair and silk amino acids counterbalance any loss of protein. Redken’s unique Interbond Conditioning System combined with Silk-Luxe Complex will give your dry or brittle hair a renewed texture and strength to leave your locks beautifully sleek and with a brilliant shine. 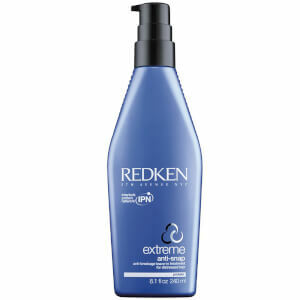 Cleanse your hair with Redken All Soft Shampoo. Massage Redken All Soft Conditioner into your hair. Concentrating on visible dry areas. For a more intense treatment leave All Soft in for 4-8 minutes and rinse. Very good on dry coloured hair and dry hair as well, Long hair coloured does become dry but I find this one softens it nicely without being to heavy. This product was bought for me as a xmas present and I now can't use anything else. My hair has never been better and It's such a good price. The product it was very good for my hair . The hair feels soft .